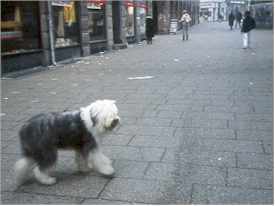 ABOVE: An Old English Sheepdog explores Str�get, Copenhagen's pedestrian zone for shoppers. INSET BELOW: Another view of Str�get. The city's official tourism site discusses the best shopping streets, the major department stores, fashion boutiques, vintage-clothing shops, interior design, flea markets, and more. This e-commerce site is operated by one of Copenhagen's oldest retailers. Check the inventory of Royal Copenhagen, Bing & Gr�ndahl, and other collectibles online before visiting the shop's premises on Koebmagergade, near the Rundet�rn (Round Tower). Danish Furniture Art claims to offer the world's largest collection of 20th Century Danish furniture design. Inset photo copyright © Visit Copenhagen.